We pick up our Travellers soon after they get picked up by the Katydid. The flight back had our heroes with guns on the kidnappers, finally getting some of the details of what went happened. I attempted to play the NPCs as well as I could, using some notes from the COTI group. So while there were no monologues, at least there was some conversation. They spilled the beans as much as they could, although they are only a small part of the entire kidnapping chain. Had to do some adlibbing as I had some vague notions of the larger plot, but decided to wait to see how things unfolded during play. Plans and players, we all know that drill. They are met at the port by the sheriff / mayor and the port crew. Having some lockable rooms in the lounge module, they march the prisoners there. Sayelle lets it be known that the gentleman waiting near the air raft is often a customer, and is more in charge of the process than they are. They are simply hired muscle. The sheriff goes down to talk with the gentleman, and as she turns to walk back inside, he makes a run for it in his air raft. While the sheriff tries a quick draw shot and misses, Max manages to take well enough aim to hit the air raft, disabling one of the grav engines. The air bag explodes and pins Lenard briefly to the vehicle. Another conversation occurs, and some contacts on D'Arlee are given. The doctor knocks Lenard out and they take the air raft to his spread, some 100km south of the port. There, after some exploration, they discover the Scout ship in the hangar, and the 4 cells in the basement. They also find the lab were he was experimenting with the creeper venom, which is also why he needed the occasional guinea pig. That probably would have been Osrum's fate. That entire scene was also adlibbed - the plan was for Lenard to get away and become some sort of potential recurring bad guy. They also find a computer and take it back to the port. With no one having any computer skills, the force Lenard to open the system up, and decrypt the drives. They find some mention of the League of Planets, and some sort of criminal group that is kidnapping Imperial citizens as an indentured labor class. The sheriff is quite willing to take the Scout ship, and she is also the judge, can easily sentence the bad guys. Although her long term plan is to get the Imperial authorities involved as they have no ready penal system. For a planet of 10 people it has never been needed. I believe everyone had a pretty good time, although we were short a few people due to illness. It looks like there will be 5 players in total. I've also got Max's background, which is well done and gives me some potential hooks. Next week we'll probably manage the jump to D'Arlee on the A2L trader which is about to make landing, and then they can go over the fancy lab ship and be greeted by the Navy crew turning over the ship, along with a request that will pay salaries and supplies for a bit. Assuming that they take the offer, which is just that: an offer to underwrite about 4-8weeks of their time and effort. Plus, it will help Osrum explore more of Planet Bob, otherwise known as Pax Stellar. 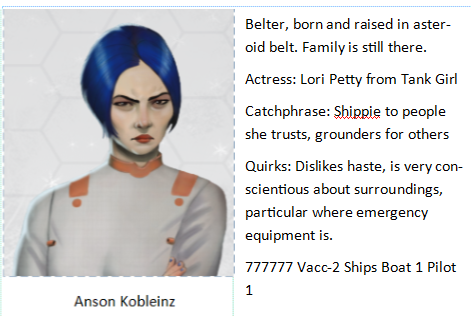 Below is a test for an NPC card with some hints to how to play her. Comes from the Flatlined Mongoose adventure, which was translated to the D'Arlee Quadrant.